Today we'll talk poop. Not much else to say other than helping baby poop in the toilet vs. his diaper is a no-brainer! Who likes changing poopy diapers? I don't. If you want to avoid changing poopy diapers, use elimination communication's easy catch #3.
how this easy catch establishes healthy habits for your baby. Potty Time Master: Learn when it's time to potty baby (even if she doesn't signal). Hello, again. 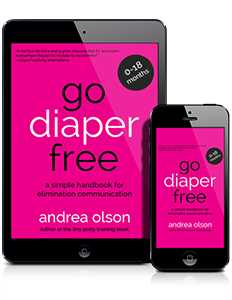 I'm Andrea Olson with Go Diaper Free. Today, we're going to talk about easy catch number three. Why should you listen to me? Because I've trained over 10,000 parents worldwide how to do EC with their babies. Easy catch number three is poop, poop catches. Okay, so let's talk about poop. This is an easy catch for most people. I say most because we have some stealth poopers out there. If you've got a stealth pooping baby, then this might not be the easiest catch for you. If they're stealth pooping, you can catch them in the middle of it and say, "Wait," and then move them to the potty and hopefully they'll finish there and then they'll get used to waiting and going. And when they start solids, they'll stop stealth pooping, usually. You really have to pay attention at that point 'cause they'll start hiding behind the furniture, needing some privacy. All right. So, poop catches. If you're sitting there and you know your baby is pooping, you're just watching them and waiting for them to poop and then you're gonna change their diaper after they've pooped in it? I mean, I wouldn't do that. I would definitely notice that they're starting to poop and say, "Hey, wait." Babies understand language at very early ages. I would say that to a newborn. "Hey, wait." Take off their diaper, even if they've started, even if it looks like they've already done a whole poop, take them over to that potty, put them in position, sit them on the potty or whatever, and *grunt* is your signal or your cue to them that, "Hey, it's okay to go to the bathroom here," help them to relax and finish on the toilet where poop goes. This establishes early on very good healthy habits, hygienic habits, for babies to know where the poop goes. This is just what you do in your household now. You're doing EC, you're catching the poop. But what I want to just really, really reiterate here is that this is an easy catch because you know when your baby's pooping, most of you do, 9 out of 10 of you do, and if you know when your baby's pooping, just catch the poops. If all you ever do for EC up until the time you decide to wrap it up with them, maybe around 14, 18 months, if all you do for EC is catch the poops, you will have a less smelly house, less smelly dirty diaper duty, I mean who likes to clean up poopy diapers? I don't. Your baby will not have to sit in his waste or poop himself and will have his dignity intact by having that help with what he can't do yet himself until he can do it himself. It is just a great thing. Easy catch number three is probably my favorite. I've got one more easy catch for you in the next video. We'll cover that soon. Please go to godiaperfree.com to learn all you need to know about EC. Subscribe to this channel, I would really love that. Give me a comment below if you have any questions, and hit a thumbs up for me on your way out. Thank you so much. I'm Andrea with Go Diaper Free. Andrea, I’m having trouble! I’ve been doing EC since my son was 6 weeks old. He did awesome!! Up until a couple months ago…. I don’t know if I caused it but he refuses to poop on the potty. He did it for months but now…. he won’t, ever! He will only go pee on the potty. So help me!!! I don’t know what to do, I set him on the potty and re assure him it’s okay to poop there. But he refuses, he likes to poop standing up now that he walks and stuff. He is 16 months old and I’m worries because I thought he would be fully trained in a few months. But I’m feeling super discouraged and I feel like it’s been a waste of time ?? what would you do!!? Mallory, I have a very similar situation with my almost 15 month old. He pees on the potty great, but it’s way harder to catch his poops. A big problem is that he’s not regular in his BMs, so they could come at any time (or he’ll go a couple days without pooping and then poop several times on a row). I really think he likes to stand while pooping. When he was EBF he pooped on his potty a lot, but ever since he started really eating solids, it’s been​a struggle. Andrea, thanks so much for the ideas! I actually just started looking into potty training, and I think he’s showing a lot of readiness signs. And I actually caught a poop this morning by intercepting him as he was pooping in a corner! I think privacy is a big factor right now. I’ve been practicing EC with natural timing/transitions since birth. He’s 2.5 months now and I’m maybe 50% on catching poops. I agree–it’s my favorite catch! So satisfying! But, I feel like I’m winging it in some ways. I generally know what time of day to expect it, which sometimes mean I take him to potty when he doesn’t need to (and I feel like I’m hovering). And, frequently, he goes just minutes after starting to nurse. He seems unhappy if we pause nursing to potty (fussing/bucking in position). So, I’m not sure what to do differently at those times? Thanks! I’ve been infant pottying my 3rd baby since a few weeks old and is now 6mths and still EBF. She stopped having regular morning poops around 4mth. I’d try to offer the top hat and get pee but never poops. After a month of misses I began using a baby constipation drink of 5ml the evening before (prune juice & probiotics) and pottying her in the morning. That has mostly worked but still the poop can come as much as 1-2hrs after waking which can stress our morning routine. I watched your video and will now change the sound from Psss-Psss to a grunt and lift under the thighs to make a true squat & see if that helps it come faster. Does anyone else feel that mothers & baby’s diet adds to constipation or ease of the poops? Has anyone else heard of tips and external tricks used to ease flow of the poops? Hi Teresa! Changing sounds is a good idea, as is adjusting your hold. I also, however, have had personal experience with fluctuations in baby’s poop (both its consistency – thick or runny – and its timing) with my newest baby, Branson, and I think sharing this may help shed some light for you. He seems to have much thicker, play-doh-like poop during times of extra sleep and what I assume to be growth spurts. He has runnier poop when he’s on a regular rhythm, his day-to-day. He is also EBF, and currently 4 months old. That said, EBF babies can poop several times a day (even at 6 months) OR can poop once per week. There’s no way to schedule the poops – they come when they come – and there is not much constipation in babies this young, although I could be wrong. If you have anything “strong” in your diet or it’s imbalanced in some way (for example, too much of one particular type of food, or too gassy of foods, etc. ), it would likely impact baby’s digestion as well. Prunes and probiotic never hurt! I wouldn’t try anything else because (1) it’s hard to make a normal poop routine with a 6 month old, and (2) soon enough that all will change. I do understand that you are trying to catch the poops more and I agree it is awesome. Just do what feels right, and also see what happens if you stop the prune cocktail for a week…perhaps baby is just showing signs of a new pattern, which is directly related to his rate of growth. Another regulating factor would be to introduce solids. You’d likely get a consistent morning poop after baby becomes used to eating solids (along with breastmilk, of course). And, again, Branson and my other 3, along with many of my readers’ babies, all stopped having regular morning poops at some point. It is a part of the ongoing spiral of growth spurts and the body re-establishing homeostasis, on its own. We can enhance that if we want to, or we can wait it out. I was ECing my baby after 3 weeks. I tried to catch the middle feeding pee/poop. I didn’t have a potty so I used a plastic Tupperware bowl. Not many catches because it was uncomfortable for both of us but when I stopped attempting I remember seeing this “why are you ignoring me” look on that sweet face. I felt horrible for stopping but I couldn’t do it. It stressed me out. Now I’m ready and more confident, but LO is 3.5 months. We’ve had some catches and a lot of misses. What I’m noticing is no warning for pooping. It’s frustrating but I’m working on offering potty time after waking up from naps and before bath. Very few catches but I’m hoping that eventually it’ll happen. How long do I hold my LO in position to pee or poop? I try for 5 minutes but very little happens. If I set LO down and walk away then there is pee when I return. What do I do to connect timing? You can try for 5 minutes and if you’re not getting any, set baby on a Kushies pad (http://godiaperfree.com/pads) and let the pad catch the pee. Cue along with it if you see her go. We’re at 4 months old with baby #4 over here, and I often do that. He is clearly learning how to roll over and occupied with absorbing his new environment. The world is opening up. He is super-slow-starting on the peepee. No worries. All normal. Have you tried to start from the beginning, with my book? It would help you cover all your bases, for sure. I’m planning a sale for next week, if you’re on my email list, so stay tuned. But if you do have it, try to do some re-learning or initial observation time, ok? In the beginning, I’d put a plastic bowl between my legs so my baby could pee/poo while nursing. I stopped because he got big and I felt like the positioning would hurt him if I continued. I also was overwhelmed. So he stopped pooping at feeding time. Baby is now 7 months and every time I’ve heard him pooping I’ve used our little Ikea potty to finish his poops. He isn’t regular and doesn’t sign but we always catch something now! Pees aren’t always caught but I’m pretty sure he understands what I’m helping him with and where it should go. I’m very interested in the poop training videos and the tiny undies!